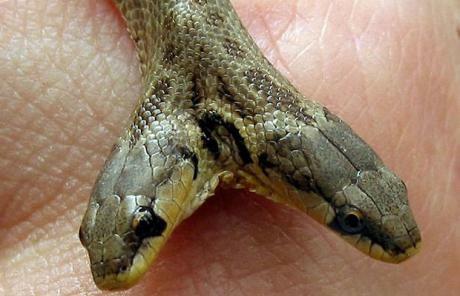 A snake with a single clawed foot has been found in China. Here's a look at some other weird animals from around the world. 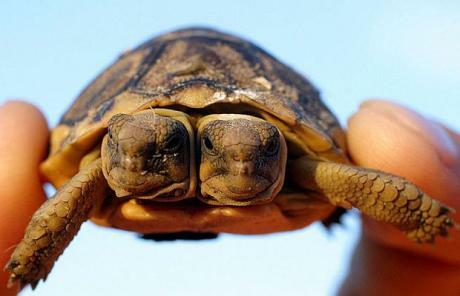 [via telegraph] Noel Daniels of Wellington discovered this one month old two-headed South African Tortoise in the Western Cape in 2003. According to tortoise expert Dr Ernst Baard of the Cape Nature Conservation, two-headed tortoises are extremly rare and might be the product of a genetic deviation during the development of the embryo. This two-headed 'Macroprotodon Cucullatus' snake was found by some workers in a hotel garden on the Mediterrannean island of Mallorca in 2002. This kind of snake reaches a length of 60-70 centimetres and its bite is not lethal for human beings. 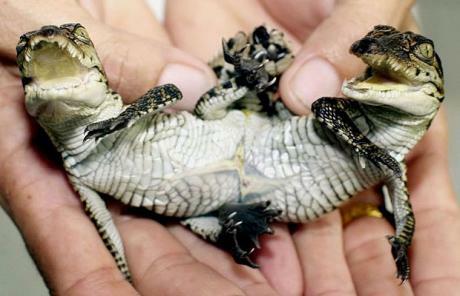 This two-headed baby crocodile was born at Samut Prakarn Crocodile Farm on the outskirt of Bangkok in June 2001. The crocodile, which shares the bottom part of the body, has eight legs and two tails. It is measured at 6.69-inches long and weighs at 0.15 lbs. 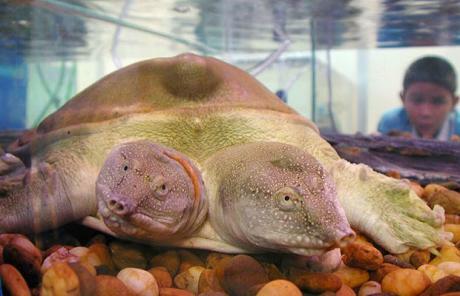 This rare 9.4 inch-long, two-headed Terrapin, an amphibious reptile with a semi-hard shell, was displayed at Thailand's government Fisheries Department in 2000 to educate people on the varieties and importance of marine life in Thailand. Terrapins, peculiar to Asia, are farmed in Thailand and then exported to Taiwan and China for human consumption in a soup which is claimed to keep the consumer warm. 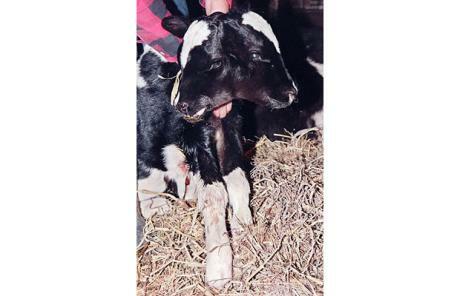 Reflections, the two-headed calf, was born at Garry Slife's farm in Independence, Iowa in 1998. It took about an hour to deliver the calf by Caesarean section. Rudy, the two-headed pig, was born in the farm of Scott and Vicki Vorwald in Iowa in 1997. Weighing nearly 150 lbs, he was sold to the Los Angeles-based animal rescue organization 'Pigs Without Partners'. 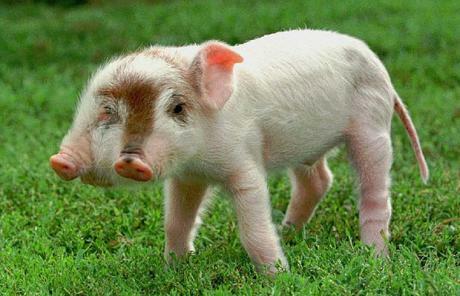 Most two-headed pigs are stillborn or die shortly after birth. 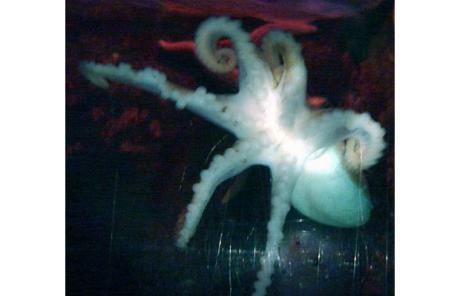 Staff at Blackpool Sea Life Centre dubbed this six legged octopus 'Hexapus'. Marine experts believe the missing limbs are the result of a birth defect rather than an accident. Named 'Henry', he was found in a lobster pot somewhere off the north Wales coast, and was one of eight lesser octopuses that Sea Life staff picked up from the Anglesey Sea Zoo. 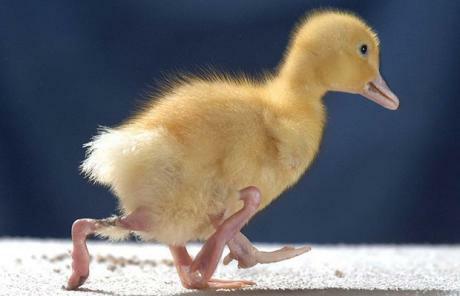 Stumpy, a four-legged duck who hatched at Warrawee Duck Farm in Copythorne, Hampshire in April 2007, made television appearances and photoshoots after thriving and growing to full size, despite his deformity. 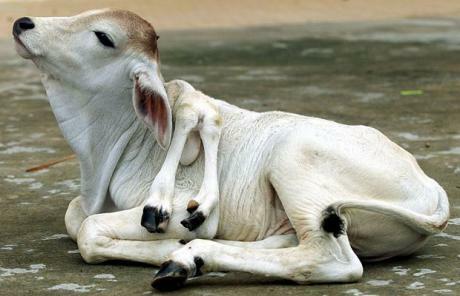 This six-legged cow was born in the Cambodian capital of Phnom Penh. The beast, named Cham Leck which means 'strange', was given to monks at a local pagoda by a farmer who feared the cow would bring him bad fortune. 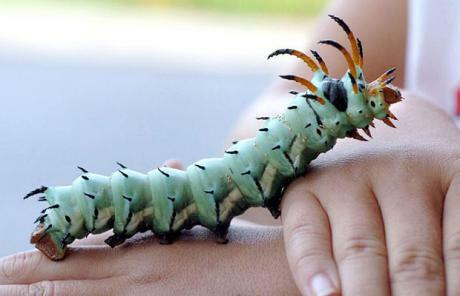 Spike, the Hickory Horned Devil caterpillar, was found by Logan Darland, 9, in the front yard of his house in July 2004 in Kentucky. The caterpillar is the larva of the Royal Walnut Moth, also known as the Regal Moth.